Stubby's tail is still growing back, but he's the ruler of the patio canna leaves. It's been three and a half months since Stubby lost his tail in some unfortunate encounter. 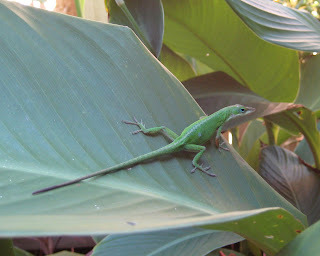 The little anole is a lesson in resilience. You can still see that the end of his tail is black where it is regrowing and reshaping. I'm feeling lucky to have a weekend for hummingbird observations and lizard reflections.